Today I'd like to review Liz Earle's Skin Repair Moisturiser™, a product I've been loving since I started using it regularly! "This perfectly balanced moisturizer softens, smoothes and conditions skin for a naturally healthy glow. Rich in natural actives, including borage oil (a rich source of the essential fatty acid GLA) and natural antioxidants beta-carotene and vitamin E to replace lost moisture and help protect normal/combination skin." Review: I've received the 50ml jar which costs 17,60£. First thing you'll notice opening it is the quite strong scent of the product...I usually don't mind scented cosmetics and this one's no ecception, however, it can be annoying for someone who doesn't like it. Nevertheless, it's a nice and delicate floral scent. The consistence of this cream is very "dense" and at first I thought it would be too heavy or "oily" for my normal/combination skin (FYI I was sent the NORMAL/COMBINATION version). With this cream, a little goes a long way because you need just a tiny bit of product to moisturize the entire face. 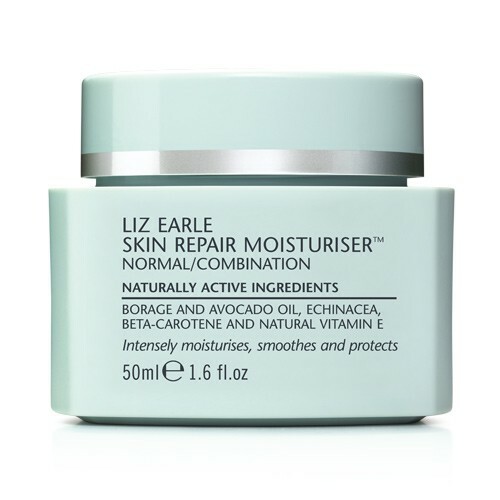 What I really love about Skin Repair Moisturiser™ is that my skin completely absorbs it but yet it remains soft and...moisturised! It's been more than a month since I started using it, applying it everyday after my Cleanse&Polish and Skin Tonic and I can definitely say I'm starting to see the results! Less breakouts and less dryness around my nose. Moreover my skin feels clean and purified. Once you know what's your skin type I'm sure you won't be disappointed by this product! The only real downside I would see is the quite strong floral scent it has, but it's yet very pleasant :) My suggestion would be to try the 15ml tube size if you're unsure whether your skin "likes" it or not ;D.
Have you tried Liz Earle's products? What do you think about them? Let me know! Disclaimer: products provided by PR's for reviewing consideration, however these are my honest opinions, I wasn't paid by the company. A special Thank you to the lovely Andrea who sent me this amazingly good product!! This seems like a great product! Probabilmente sono una delle poche che non ha ancora provato un prodotto di questo marchio. Mi piace il packaging, ma preferirei inci più verdi. Cara Aru, sul mio blog ho aperto il primo giveaway! In palio ci sono tre smalti della China Glaze... Ti va di venire a sbirciare? Ti aspetto! Promuovo anche io questa crema, ma mi che la stacco per questo periodo perché la mia pelle inizia a risentire del caldo. Gh. E nonstante anche io abbia questa formulazione e la mia pelle sia in aclune zone secca sta diventando un po' ricca per il periodo caldo... mi sa che per l'inverno sarà perfetta! è diventato uno dei prodotti che preferisco di questo marchio! !mi ci sono trovata molto bene!! Giveaway sponsorizzato da SIGMA sul mio blog! Se vuoi partecipare sei la benvenuta!